New alleged renderings of the 4.7-inch iPhone 6 said to be sourced from primary Apple supplier Foxconn have surfaced on Chinese site Wei Feng [Google Translate, via GforGames]. The renders, which show measurements of 138 x 67mm for the device, appears to be consistent with drawings published in Japanese magazine MacFan last month, and in line with precise measurements of a mockup done by Taiwanese blog AppleCorner last week. Similar to details in other reports, the new renders show a number of design changes on the iPhone 6, including rounded corners, rectangular volume controls on the left, and a relocated power button on the top right hand side. Also shown is a cutout for the Apple logo on the rear of the device, which appears to be different than the current logo found on the iPhone 5s and previous models. 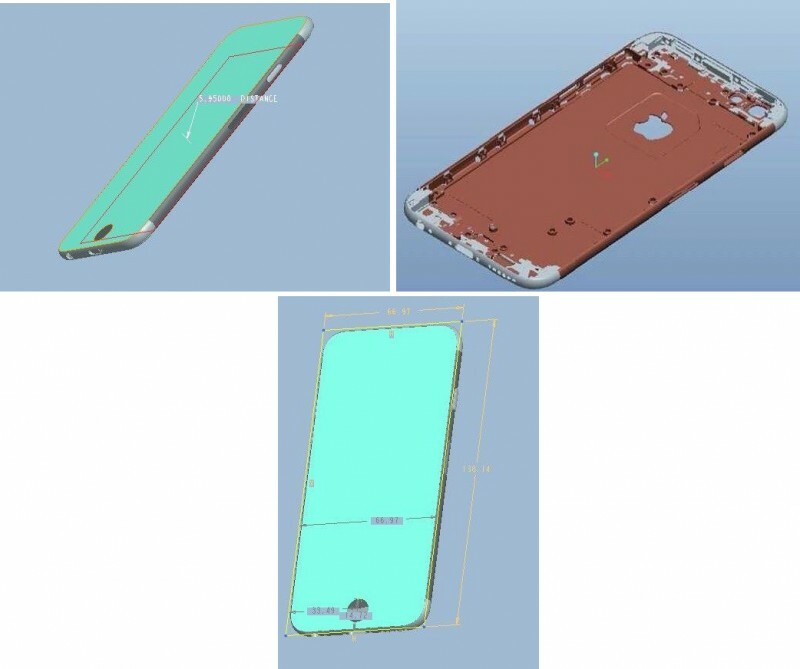 Notably, the drawings show two antenna breaks cut out on the rear of the device, which seems to suggest that Apple will incorporate a three-stage aluminum design on the back of the iPhone 6. A report from Mac Otakara last month claimed that Apple would be doing away with the glass breaks currently found on the iPhone 5s, although it is unsure how Apple will change its overall antenna design to accommodate the new look. Apple is expected to unveil the iPhone 6 later this year, with a recent report stating that the company will launch the 4.7-inch version in August and the larger 5.5-inch version in September. Aside from a large display, Apple's next-generation iPhone will likely include a thinner profile, a new A8 processor, and an improved camera in the form of either optical or electronic image stabilization. Anyone notice the flash isn't dual-LED? I strongly doubt they'd go backwards. Anyone notice the staggering lack of imagination among forum members? Perhaps it's part of the antenna system, like with the iPad. My biggest wish for the next iPhone is 32GB base storage capacity. Someone needs to make the jump. This phone is "unapologetically" 3 years late. Samsung will have time to copy it and release a copycat phone before the 6 is released. The lit up logo is actually just a window in the back of the LED screen assembly that allows the backlight to show through. No extra electronics. But in the iPhone the battery is interposed between the screen and the back case, so it wouldn't work. They could just add a thin light panel. I did it with my iPhone 4S.